Members of the brigade’s 2nd Battalion, 28th Infantry Regiment escorted a group of U.S. heritage tourism experts to the ruins last week for the first of several visits to develop a preservation and tourism plan for the area. U.S. and coalition troops have been criticized in the past for damaging and contaminating artifacts. In a 2006 report, the head of the British Museum’s Near East department said that, among other things, military vehicles crushed a 2,600-year-old brick pavement, and sand and archaeological fragments were used to fill military sandbags. 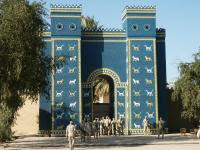 Now the rapidly improving security situation in surrounding Babil province has persuaded the U.S. State Department and the Iraqi State Board of Antiquities and Heritage to embark on the preservation project, dubbed the Future of Babylon Project. Last month, a British art publication had a story headlined, “Controversial move to reopen Babylon: State board of antiquities and heritage believes site needs more protection.” The story indicated that Babylon would be open for tourists on June 1st. Another recent story out of Taiwan noted that a Taiwanese tour agency is starting to take people to Iraq to tour — among other things — the city of Babylon as it is being rebuilt. As Iraq becomes increasingly stable and secure, foreign direct investment is going to flood in, and Iraq will become the wealthiest country on the planet. Skeptics take note: the Bible is coming true, one prophecy at a time.